SAIPUA: banana legs and more! In 1893 the Supreme Court unanimously decided that the tomato would be classified as a vegetable (Nix v. Hedden). This however is not technically correct. Botanically, the tomato is a fruit (specifically a berry) because it acts as the ovary (together with the seeds) of a flowering plant. If at this point you are wondering if I am procrastinating, you would be correct. i knew that the tomato was a berry and all that ovary nonsense, but i didn't know about the supreme court ruling! that's hilarious! 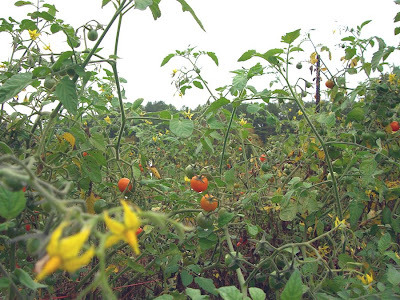 are you going to start a tomato garden? i'll go in halfsies with you if you want to split shipping costs for junks. I guess I'll be getting the beds ready for those baby heirloom tomato plants soon. Mom; you guess?? Act like you KNOW! G; I'll let you have your pick once they sprout. unless you want the seeds.